My father grew up in a restaurant. His parents owned the Golden Dragon, a sprawling Chinese eatery in Portland, Ore., that offered egg rolls and grilled-cheese sandwiches on its official menu and bitter melon with black-bean sauce and birds' nest soup on its unofficial one. He tells stories of after-school hours spent peeling water chestnuts and washing dishes with his brothers and sisters while the flare of hot woks and the rhythm of cleavers filled the busy kitchen. On New Year's Eve, the kids stayed up all night, serving sweet-and-sour pork and cocktails to mobs of hungry revelers. Dad's apprenticeship at the hands of a gifted chef father and savvy manager mother gave him a lifelong love and appreciation of good food and restaurants -- and drove him to stay as far away from the culinary biz as possible. By the time my sisters and I appeared on the scene, Dad generally stayed out of the kitchen. His culinary responsibilities were limited to standard dad stuff -- grilling burgers and steaks in the backyard -- and a single indoors task: folding wontons. Wontons -- square pasta wrappers folded into elegant little pods around a savory mixture of ground pork, vegetables and sometimes seafood -- are dead easy to make, but there's a catch: there are no shortcuts for folding them the right way. Our hungry family of six could go through a boatload of them in a single meal, but there was no way Mom could fill and fold all of these herself, not with so much housework to deal with and so much childhood misbehavior to monitor. So the folding fell to Dad, who brought to the enterprise serious mass wonton-folding chops, courtesy of the Golden Dragon. I can still see the setup: It's Saturday (or Sunday) afternoon, and Dad is at the kitchen table. Mom's filling, smelling tantalizingly of scallions and sesame oil, sits in a glistening pink mound in a mixing bowl in front of him. Next to the mixing bowl is an open packet of wonton skins, which Dad keeps covered with a towel so they won't dry out and crack when folded. At his side is a small bowl filled with beaten egg and a kitchen knife (the egg is the glue that holds the wontons together), and somewhere nearby on the table is a baking sheet soon to be filled with perfectly folded wontons. By time I got to grade school, I wanted to fold wontons too. I was a bit of a tomboy and seriously into origami, and folding wontons fed both these impulses: Because Dad was the chief wonton folder in the household, I somehow got it into my head that wonton-making was one of those noble masculine arts, like bug-collecting and compass navigation, that would be worth aspiring to. And properly folded wontons are a thing of geometric beauty. By the time I was 8 or so, I'd be sitting beside him, folding away. It made me feel powerful and useful. For whatever reason, none of my sisters ever took an interest in wonton folding, so I got to see something they didn't. My parents were masters at keeping up a unified front before us kids, but when it came to wonton folding, this seemingly impenetrable facade ever so slightly cracked. Dad often warned me not to overfill the skins, lest they burst wastefully when boiled in soup or deep fried. Meanwhile, Mom, who grew up on decadent meals Dad could only dream of in his youth, always scolded him for the stingy amount of filling he used. "Fred! This isn't the Golden Dragon!" It took me a while to figure out how to fill and fold wontons in a way that kept both Mom and Dad happy. The optimal amount of filling had to be small enough not to cause the wrapper to tear or the seams to come loose when folded, but big enough to offer diners a generous meaty bite or two. 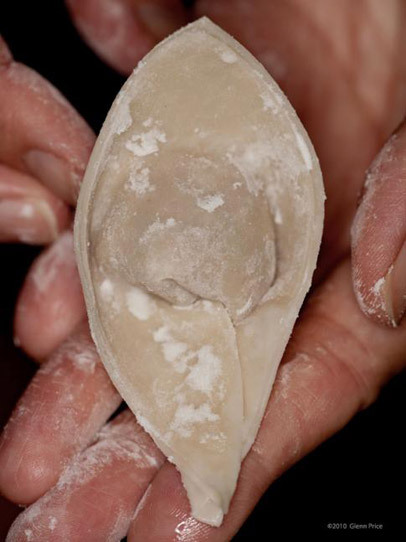 In wonton folding, as in a functional family life, patience and little compromises are the boring but sure secrets to success. Mom always made ginormous batches of wontons so she could keep some in the freezer for later. To freeze uncooked wontons, lay them on a baking sheet so they don't touch and put the sheet in the freezer until the wontons are frozen solid. Once frozen, the wontons can be transferred to a freezer bag for storage. On a cold weeknight when you don't feel like cooking, take some out of the bag, allow them to thaw, and throw them into a pot of simmering broth for a comforting dinner. I've adjusted the recipe to make a more modest number of wontons -- only about 100. I've also included instructions for the two most common ways of serving them, cooked in soup and fried. The soup recipe serves 2-4; the fried wonton recipe makes as many or as few as you need. Unless you're serving dozens of people, you'll still have some wontons left over for the freezer. Folding all of these will entail about an hour of meditative handiwork for one person, or a pleasant bonding experience for two. Thoroughly combine all the ingredients save wrappers and the egg in a medium mixing bowl. 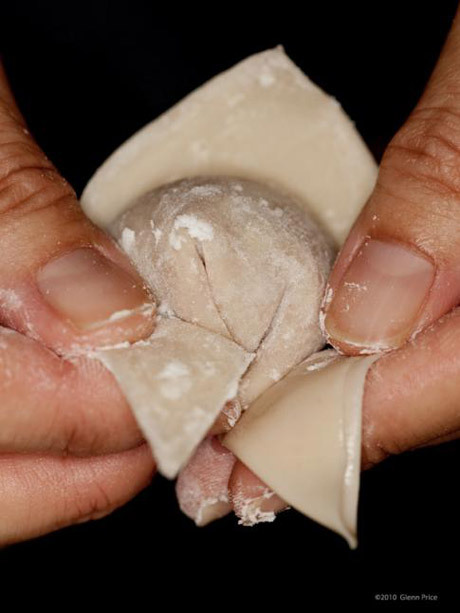 Get ready to fold a wonton: Take a wonton wrapper and hold it in your non-dominant hand. Place about 1 heaping teaspoon of filling in the center of the skin. Using a knife or small pastry brush, wet the edges of the skin with water or egg. The first fold is simple: Fold the skin in half diagonally so that it completely encases the filling. Press the edges together, being mindful to squeeze out any air bubbles between the filling and the skin. Be sure the edges are completely sealed, with no gaps. The second fold tends to throw people. 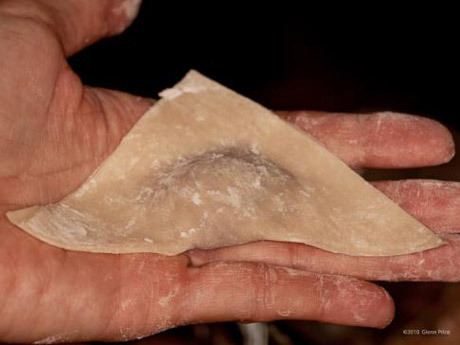 Your half-folded wonton now looks like a triangular turnover, with one perpendicular corner and two "arms" (long, sharp corners). Dip one of the "arms" of the wonton into egg or water. Then pull it toward the other arm and press the arms together so that the top surface of one of them is firmly glued to the bottom surface of the other. Repeat 2-4 until the filling and/or wonton skins are exhausted. (Any leftover skins can be wrapped tightly in plastic and stored in the freezer for use with the next batch. Any leftover filling can be rolled into small balls and dropped into soup as meatballs.) Keep folded wontons and skins covered while you work so they don't dry out. To cook, simply add the wontons to a large pot of vigorously boiling water until they float and the skins look wrinkly. Or use the soup or fried wonton methods below. For wonton soup: Heat one quart of chicken broth in a pot until it starts to boil. Carefully place about 12 wontons in the pot along with any meat and/or vegetables you'd like to add. (Mom used wonton soup as a convenient repository for leftovers.) When the wontons float to the top of the broth and look wrinkly and translucent, they're done. Toss two thinly sliced scallions over the soup as a garnish. This amount will serve two people as a lunch, or four people as an opener to a larger meal. For fried wontons: Heat about 2 inches of neutral cooking oil (such as canola) in a heavy saucepan over medium-high heat. When it's hot enough to make a drop of water sizzle on impact, add wontons, one at a time. The number that you can add will depend on the size of your pan, but you don't want them close enough to touch each other. Fry until the undersides are golden brown; flip and fry until the second side is also golden brown. Immediately remove from the oil, drain well on paper towels, and serve hot with sweet and sour or hoisin sauce.